The Sheldon Jackson Museum’s October Artifact of the Month is an Inupiaq cribbage board made of walrus ivory (SJ-II-Y-132). The cribbage board was donated to the museum in 1975 by Frank Gebhard of California. It is not known who made the cribbage board, nor how or from where exactly Gebhard acquired it, but notes in the file state that this fine example of a curios trade item is from the “Kotzebue - [Cape] Kresenstern” area. 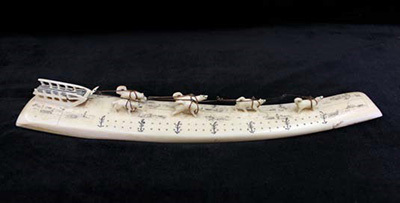 The cribbage board features a carved sled and team of six dogs, a human figure, now detached, and eleven finely etched hunting scenes between the dogs bordered on each side with a row of seven unidentified single plants. The small drawings depict seal hunting, processing seal, seal hide stretched out drying, drying fish, and eating. The earliest ivory carvings date back to over 1,000 years and come from the Ipiutak culture, a northern Native culture present in Alaska from A.D. 100 to 600 (the Ipiutak pieces were found near Point Hope). Inupiaq people living south of Point Hope and out on the islands of the Bering Sea have carried on the tradition of walrus ivory carving, using ivory for toys, personal adornments such as lip plugs, and for tools and implements – a necessity until the introduction of metal due to the lack of wood, except for rare drift wood. Ivory was used to make hunting equipment such as harpoon heads, shaft-ends, seal scratchers tipped with seal claws for scratching on ice, bolas for catching small game, snow goggles, and sled runner edges. Hunting from the water also required ivory accessories including boat fittings, harpoon rests, shuttles for weaving nets, net gauges, fish lures, and plugs for bladder floats. Household articles made of ivory included bows for bow drills, snow knives, and snow shovel ends, tobacco pipes, hollow containers such as snuff boxes, and many other items. Small carvings of people or animals used as toys or amulets were also made. Inupiaq were also known for their engraving pictures on walrus ivory. Originally drawings on ivory probably helped keep records of events or to give good luck for hunting. Figures of men and animals and elaborate hunting scenes were scratched onto the surface with sharp flints after soaking the ivory in urine to make the surface easier to cut. After engraving, a mixture of gun powder and blood was rubbed into the lines to make them stand out. In more contemporary times, engraving has been done with steel knives. After the tourist trade developed in the latter part of the 19th century, Inupiaq began making cribbage boards and other popular items from walrus ivory to sell to passing travelers. A cribbage board could be made taking a long section from a fairly straight tusk, drilling rows of small holes in the top for the counting pegs and fitting it out with four peg legs below – they often added decoration in the form of engraved scenes or handsome floral designs as seen on the October Artifact of the Month. The Sheldon Jackson Museum is home to eleven Inupiaq cribbage boards. The October Artifact of the Month will be on exhibit until October 31st. Visitors may see these artifacts and other examples of ivory carvings in the collection at the museum during operating hours - Tuesday through Saturday between 10 am and 4:00pm. General admission is $6, $5 for seniors, and free for those 18 and under or members of either the Friends of the Sheldon Jackson Museum or Friends of the Alaska State Museum. Lee, Molly. “A Piece of the Past: Alaskan Eskimo Art and the Nome Gold Rush, 1895-1915.” Studies in American Indian Art: A Memorial Tribute to Normal Feder, Ed. Christian F. Feest. Seattle: University of Washington Press, 2001. Ray, Dorothy Jean. Graphic Arts of the Alaskan Eskimo. Washington, D.C.: Indian Arts and Crafts Board, 1969. Rearden, Jim. (1969, June) Alaska’s Walrus Ivory Artists. Alaska Sportsman. 10-11.